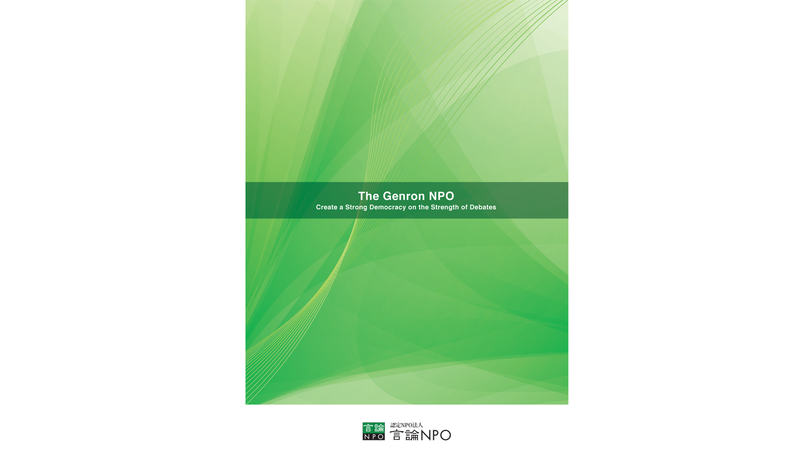 From June to July 2017, The Genron NPO and East Asia Institute (EAI) conducted joint public opinion polls in Japan and South Korea. 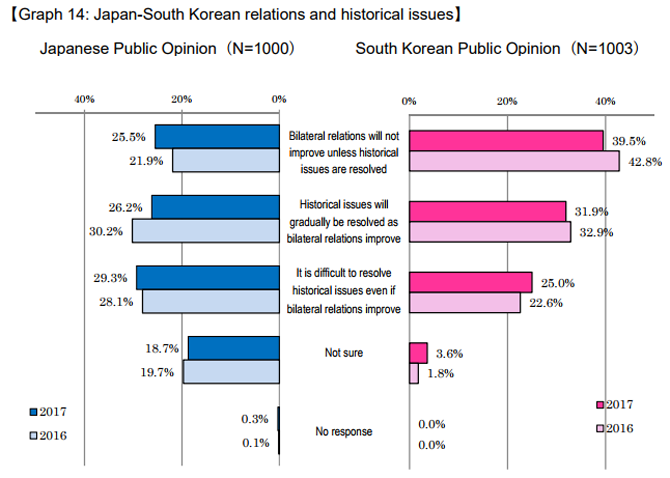 The purpose of this annual survey is to grasp the state of mutual understanding and perception of each other between the Japanese and South Korean public and to monitor the changes over time, in order to contribute to reducing various misunderstandings among the two countries, and to promote greater mutual understanding between them. The result of this survey will be presented and utilized in a dialogue between Japan and South Korea, at 'Japan-Korea Future Dialogue' on July 29th, 2017. The opinion poll in Japan was conducted between June 17th and July 2nd by door-to-door home-visit method targeting men and women aged 18 and over. 48.6% of the respondents were men and 51.4% of them were women. The number of total valid responses was 1,000. The final academic qualifications of the respondents were as follows; elementary/middle school graduates: 8.3%, high school graduates: 46.5%, junior college/technical college graduates: 19.1%, four-year university graduates: 22.2% and graduate school graduates: 1.8%. Age distribution of the respondents were as follows; under 20: 2.3%, between 20 and 29: 12.1%, between 30 and 39: 14.8%, between 40 and 49, 17.3%, between 50 and 59, 14.5%, and 60 and above: 39%. The opinion poll in South Korea was conducted between June 11th and June 29th by face-to-face interview method, targeting men and women at the age of 19 and over. 49.8% of the respondents were men and 50.2% of them were women. The number of total valid responses was 1,003. The final academic qualifications of respondents were as follows: middle school graduates or below: 14.8%, high school graduates: 37.6%, junior college graduates and above: 47.7%. Age distribution of the respondents were as follows; between 19 and 29: 17.6%, between 30 and 39: 17.4%, between 40 and 49, 20.5%, between 50 and 59, 19.8%, and 60 and above: 24.5%. While impressions of South Korea among the Japanese once again worsened, impressions of Japan on South Koreans showed improvement following last year's trend. "Historical issues" and the "territorial conflict" continue to negatively impact the impressions of both countries on one another. In terms of good impressions, most Japanese mention South Korean modern culture, while most Koreans mention Japanese national character. 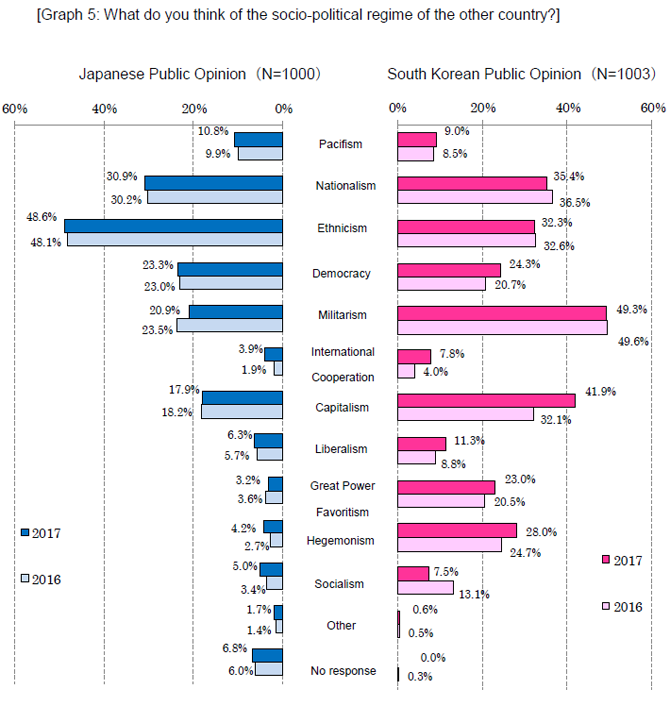 Approximately 70% of both Japanese and South Koreans consider current national sentiments to be "undesirable" or "problematic," showing an increase from last year. 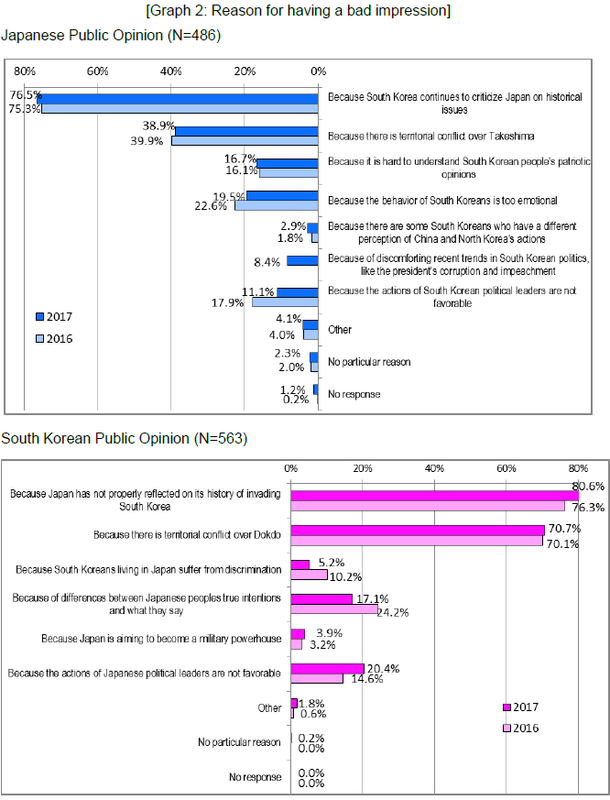 Nearly half of the Japanese view South Korea as a currently "ethnicistic" country while nearly half of the South Koreans view Japan as a currently "militaristic" country. 20% of both nationals see one another's countries as "democratic." Around 60% of both nationals perceive present Japan-South Korea relations as "bad," both showing an increase from last year. 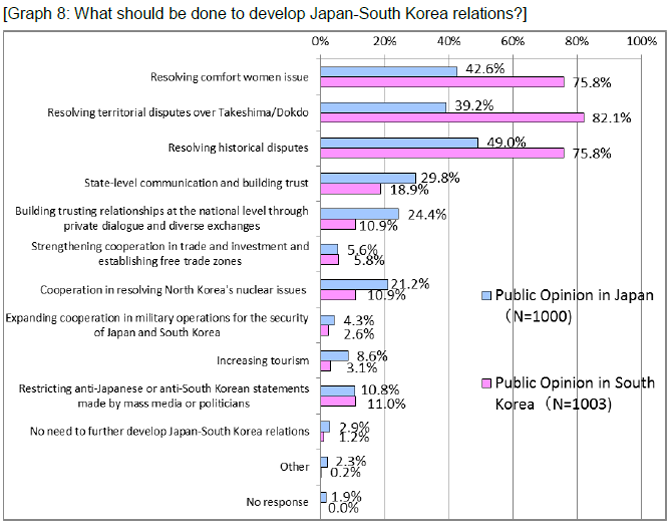 Concerning future Japan-South Korea relations, while most of both Japanese and South Koreans believe that relations "will not change," among South Koreans, there has also been an increase in opinions that relations will improve. 3-2. What Should be Done to Improve Japan-South Korea Relations? 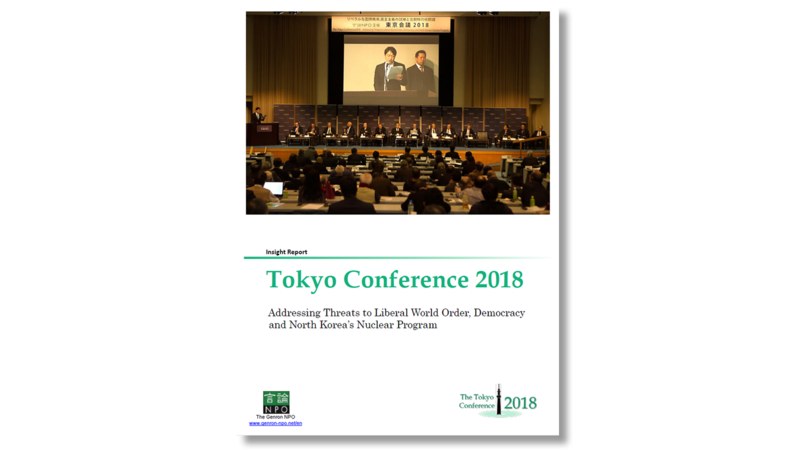 While South Koreans consider "territorial disputes," "comfort women" and "historical issues" to be significant in improving Japan-South Korea relations, the Japanese also view "state-level communication and building trust" to also be important, mentioning a variety of issues that should be addressed. Only 10% of South Koreans believe "cooperation in resolving North Korea's nuclear issues" will contribute to improving Japan-South Korea relations. Following last year's trend, 60% of Japanese and 90% of South Koreans consider Japan-South Korea relations to be "important." 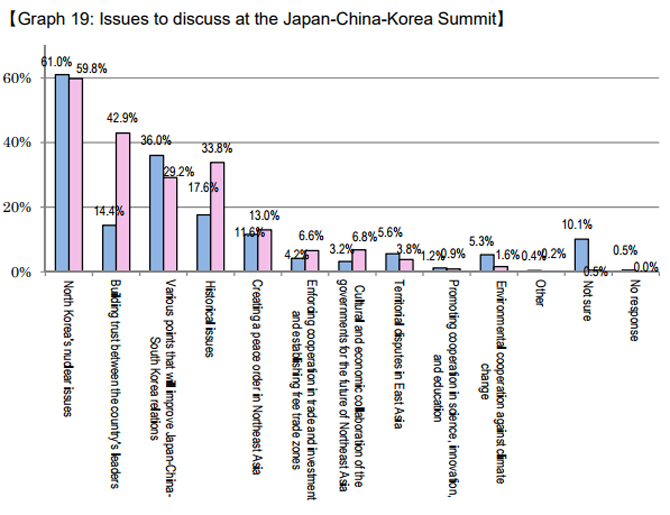 Concerning Japan-South Korea relations and relations with China, approximately half of both Japanese and South Koreans feel that "both are equally important." For South Koreans, nearly 40% consider relations with China to be more important than relations with Japan, showing a slight increase from last year. While the percentage of Japanese who "feel more affinity towards South Korea" dropped from last year, the percentage of South Koreans who "feel more affinity towards Japan" has increased. 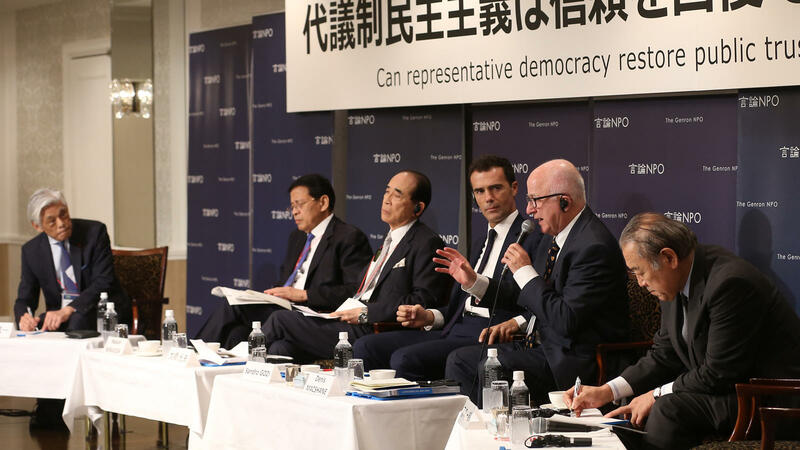 The Japanese feel that the "United States" is the most important country in terms of their nation's future. South Koreans view "China" as important in addition to the "United States." For the Japanese, opinions are split between those who "want to go" to the South Korea and those who "don't want to go." In contrast, nearly 70% of South Koreans wish to visit Japan, showing an increase from last year. 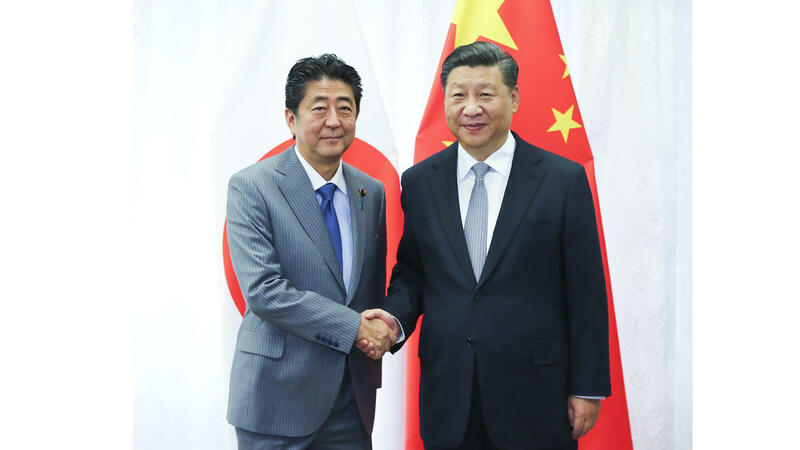 Over the past year, there has been a slight increase in Japanese who feel that "bilateral relations will not improve unless historical issues are resolved" and a decrease in the optimistic view that "historical issues will gradually be resolved as bilateral relations improve." For South Koreans, there has been a slight increase in those who feel that a resolution to historical issues will be difficult. In terms of historical issues that should be resolved, there has been a large increase in both nationals who mentioned the "comfort women issue." In terms of the agreement between Japan and South Korea on the comfort women issue, over 40% of Japanese "approve" of the agreement, just slightly below last year's result. 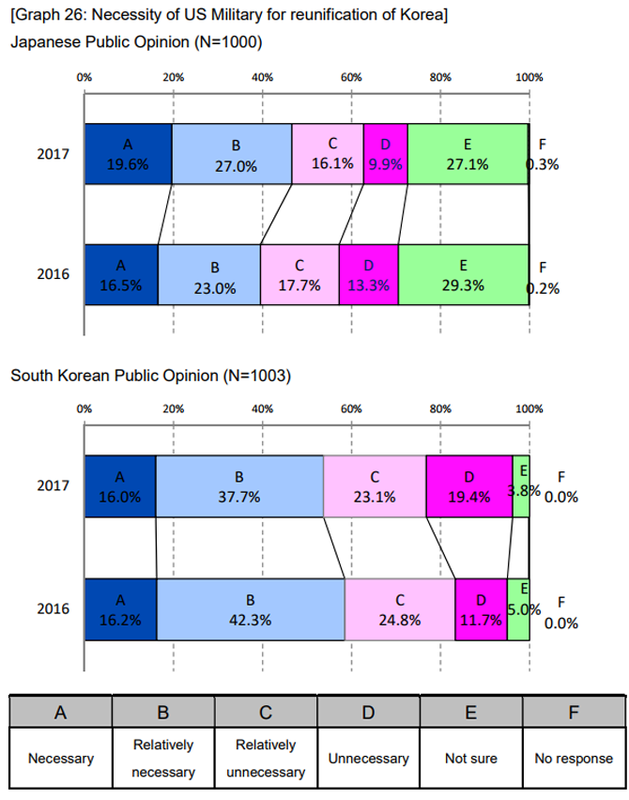 For South Koreans, the percentage of those who "disapprove" increased 18 points from last year and constitutes over half of the opinions this year. 5-3. Has the Comfort Women Issue Been Resolved? 50% of Japanese and 70% of South Koreans feel that the comfort women issue has not been resolved by the agreement reached between the two countries. 5-4. How do the Japanese View South Korea's Disapproval of the Agreement? Half of the Japanese say they cannot understand why so many South Koreans disapprove of the agreement and seek implementation of the deal on the South Korean side. Under 10% feel that opinions from the South Korean side should be adopted to amend the deal. There has been a sharp increase in views among both Japanese and South Koreans that "North Korea's nuclear issues" should be discussed at the Japan-South Korea-China Summit, constituting 60% of opinions on both sides. The Japanese still do not have any fixed impression of President Moon Jae-in. South Koreans continue to have a "bad impression" of Prime Minister Abe, constituting 80% of South Korean public opinion. 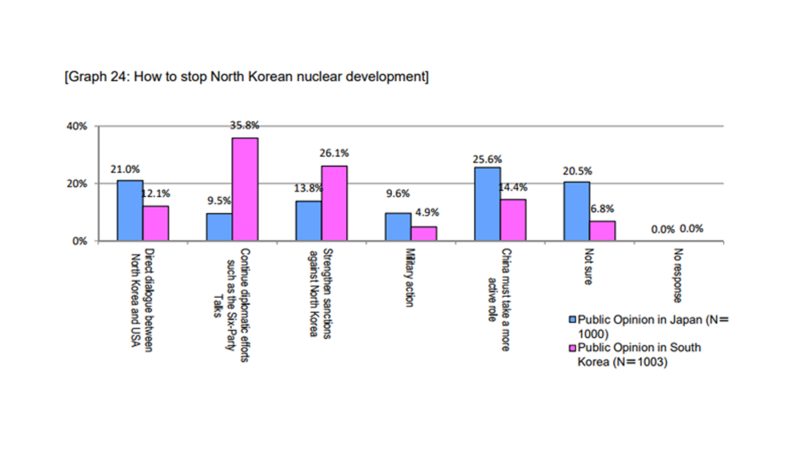 Approximately 70% of both Japanese and South Koreans feel that the North Korean nuclear weapons issue is difficult to resolve. In South Korea, however, approximately 20% anticipate that the issue will be resolved in 10 years. At the same time, while 40% of the Japanese believe that military action by the United States and other nations "will occur," over 40% of South Koreans believe that military action "will not occur." 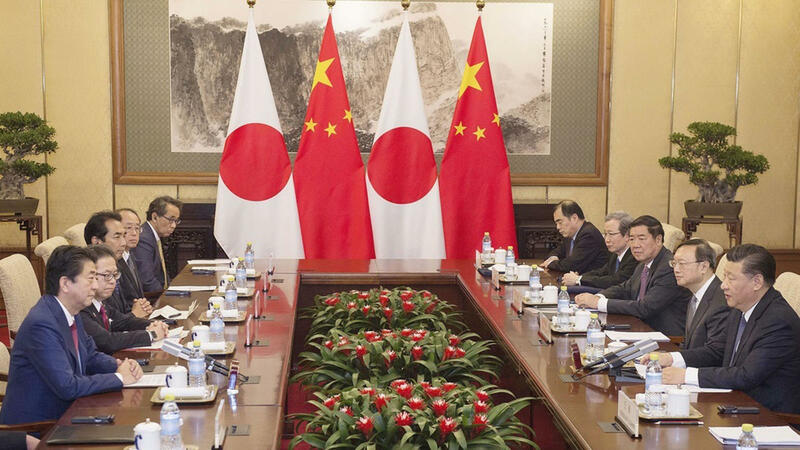 In terms of effective means for stopping North Korea's nuclear weapons development, the Japanese feel that "China must take a more active role" and "direct dialogue between North Korea and the USA" must take place. Most South Koreans, however, responded that "continuing diplomatic efforts such as the Six-Party Talks" and "strengthening sanctions against North Korea" would be more effective. 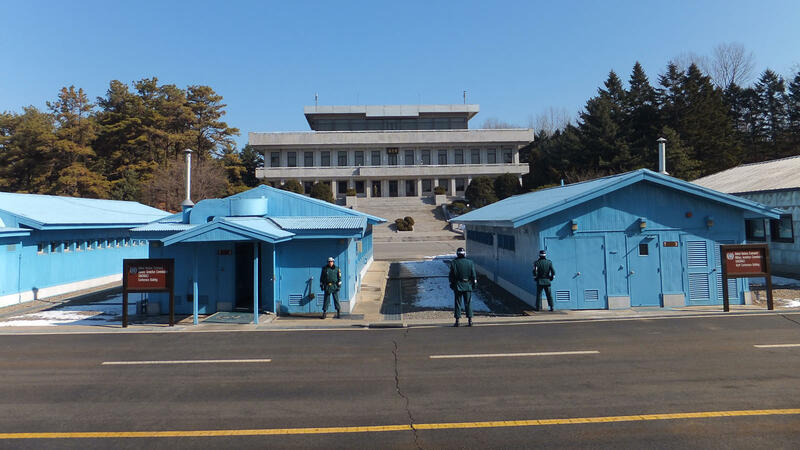 In both Japan and South Korea, there has been an increase in those who anticipate "conflict to intensify between North and South Korea" 10 years from now, based on the actions of North Korea. Over half of the South Koreans and more than 40% of the Japanese feel that U.S. military presence is "necessary" even if North and South Korea were to be peacefully reunited. As compared to the previous year, however, these percentages have fallen on the South Korean side and risen on the Japanese side. 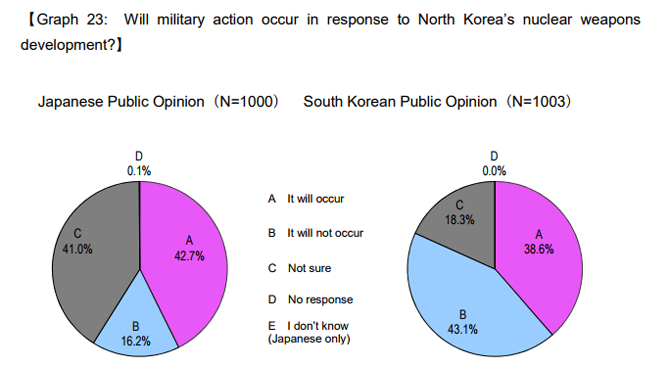 80% of both Japanese and South Koreans feel that "North Korea" poses a military threat. 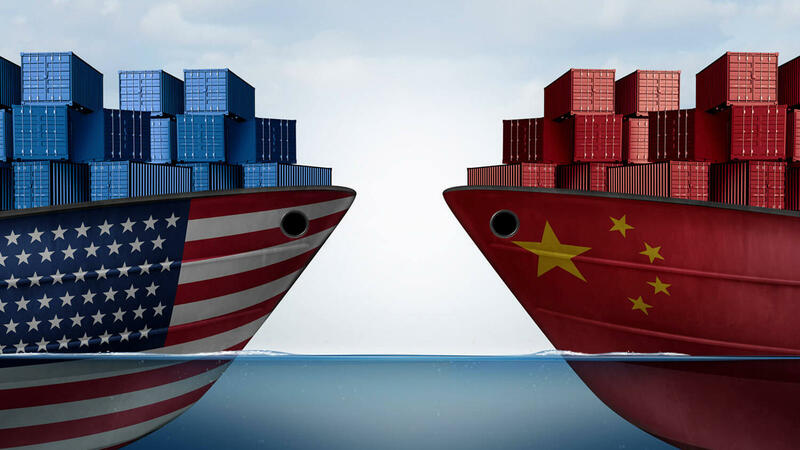 In terms of "China", however, the percentage of Japanese who see China as a military threat fell 27 points while the same percentage of South Koreans rose 14 points. 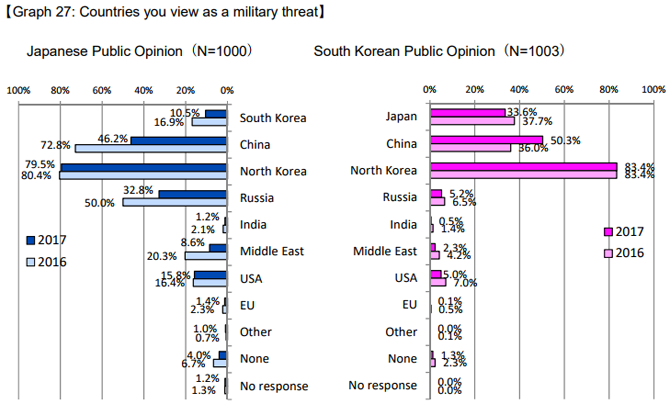 There continue to be around 30% of South Koreans who view "Japan" as a military threat. In terms of the possibility of military conflict between Japan and South Korea, over 60% of the Japanese believe that conflict "will occur." 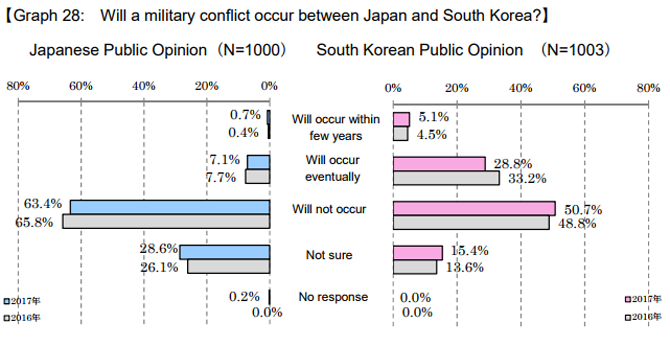 Among South Koreans, combining the percentage of those who responded "within a few years" and "eventually," this percentage dropped from last year; however, nearly 30% still believe that military conflict "will occur." 9-2. Possession of Nuclear Weapons - Agree or Disagree? Over 70% of Japanese and South Koreans "disagree" with the prospect of Japan acquiring nuclear weapons. However, those who "agree" have also slightly increased on both sides compared to the previous year. 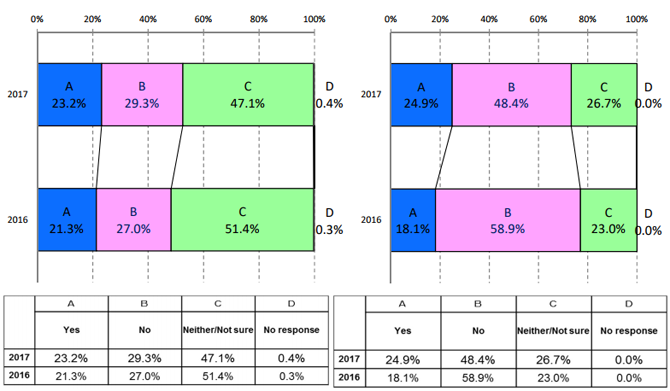 In terms of South Korea acquiring nuclear weapons, nearly 80% of the Japanese "disagree," while nearly 70% of South Koreans "agree," showing an increase from last year in those who "agree". 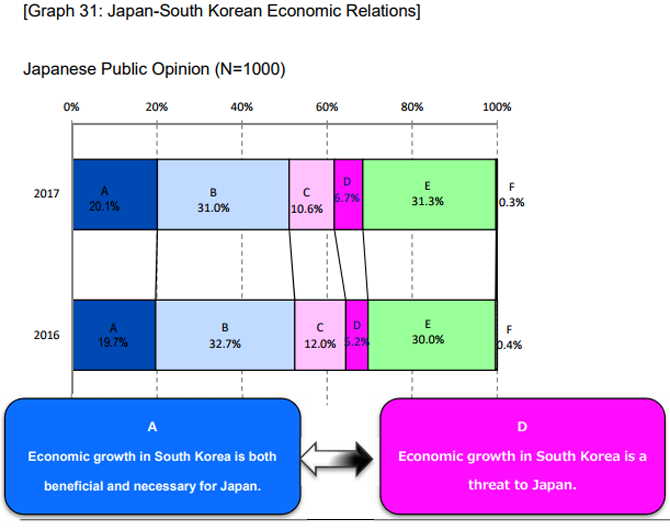 In terms of the economic relationship between Japan and South Korea, over half of the Japanese view South Korea's economic development to be "beneficial" to Japan as well. 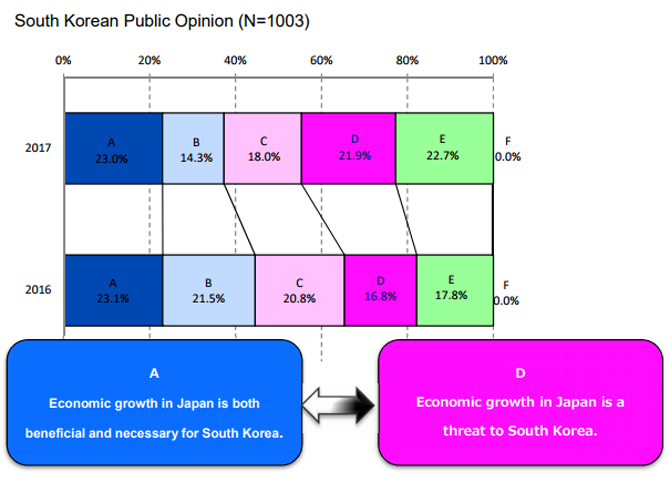 In South Korea, however, 40% feel that Japan's economic development is a "threat," and this percentage has increased from last year. 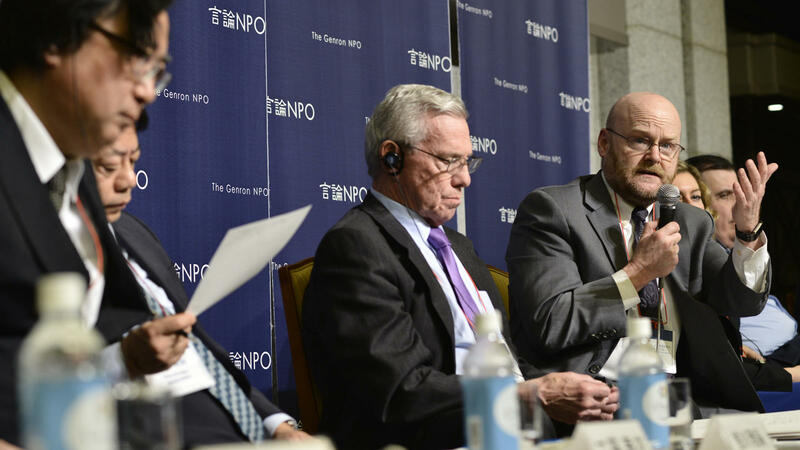 Most of the Japanese responded that "the United States" is the most "economically important country" to their nation. "China" followed, but was 14 points below last year. Other countries selected by 20-30% of Japanese respondents included the "ASEAN," "EU," "India," and "South Korea." 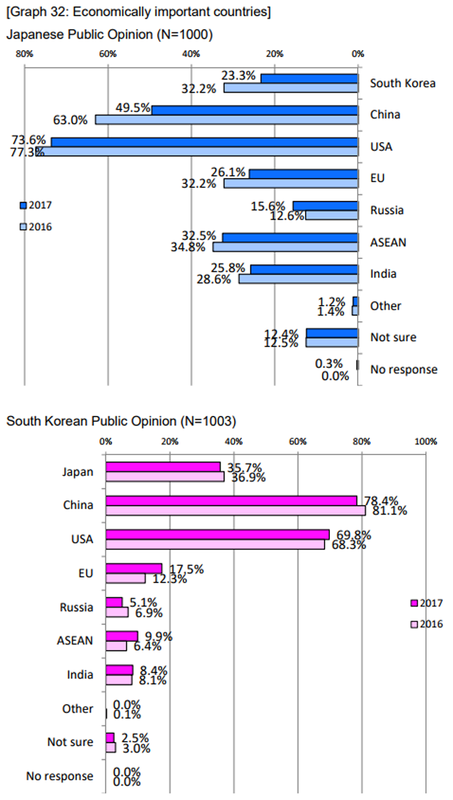 On the other hand, close to 80% of South Koreans believe that "China" is the most important, while "the United States" constituted about 70% of responses. "Japan" (35.7%) followed, and South Korean responses centered on these three countries. 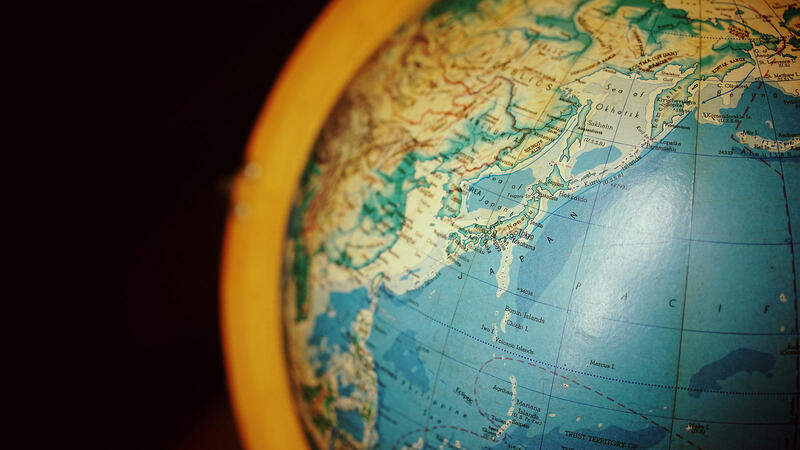 In terms of changes in Japanese, Chinese and South Korean influence in Asia over the next decade, most of both Japanese and South Koreans believe there will be "no change" in Japanese influence. The percentage of those Japanese who foresee an "increase" in Japanese influence, however, has decreased compared to last year. On the other hand, it has largely increased for South Koreans, constituting over 30% of responses. 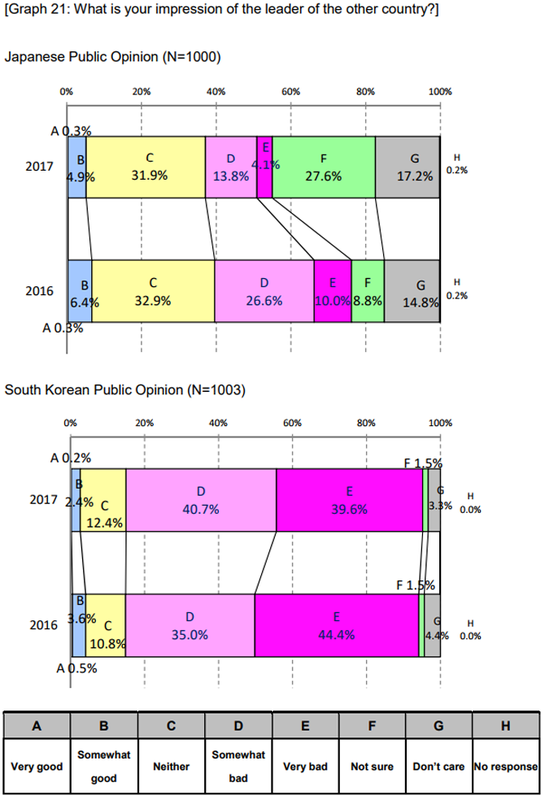 The view that there will be "no change" in South Korean influence constituted the majority of responses, at 40% for the Japanese and 60% for the South Koreans, however, 30% of South Koreans also foresee an "increase" in South Korean influence. 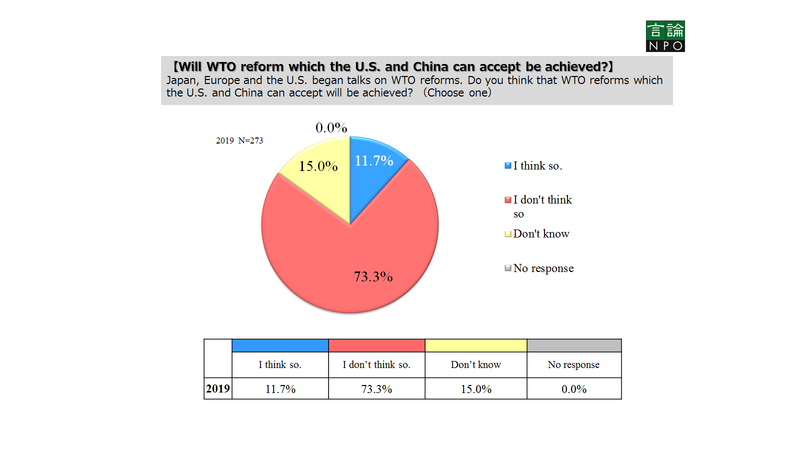 As for Chinese influence, most of both nationals feel that it will "increase." 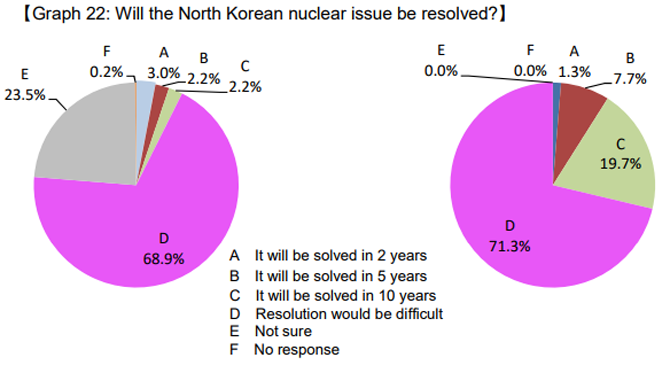 For South Koreans, this percentage constituted over 70% of responses. 12-1. Are Domestic Media Reports Objective and Fair? In terms of the objectivity and fairness of domestic media in both Japan and South Korea, while most Japanese respondents selected "not sure/ no response", over half of the South Koreans feel that their media coverage is not "objective and fair". This percentage, however, fell 11 points from the previous year. 12-2. Does Public Opinion on the Internet Appropriately Reflect the People's Views? 40% of the Japanese and 60% of South Koreans feel that the internet "does not appropriately reflect the people's views." 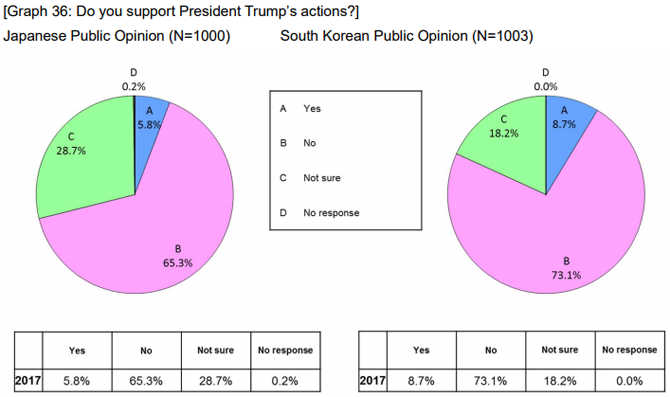 Over 60% of the Japanese and 70% of South Koreans replied that they do not support President Trump's actions and his backwards stance towards free trade and multilateralism. 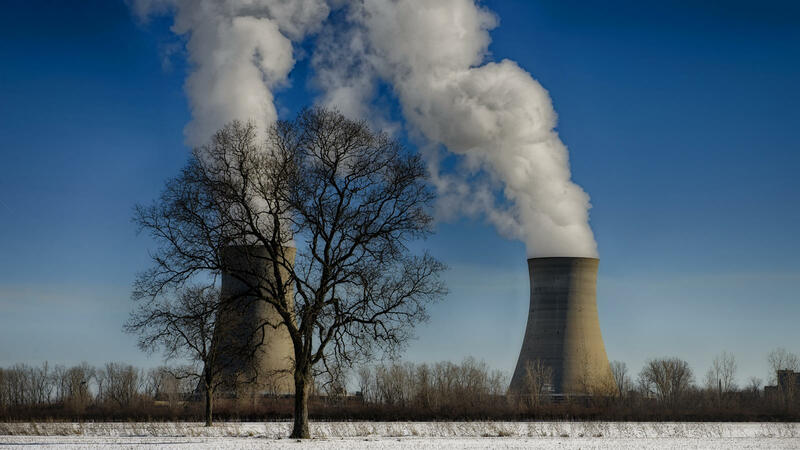 In terms of the influence of the Trump administration's actions on Northeast Asia, both Japanese and South Koreans are concerned with "security problems regarding North Korea's nuclear issues." On the other hand, concern over "alliance issues such as Japan-USA and South Korea-USA" constituted a high percentage of 70% among South Koreans, while it constituted a low 30% among the Japanese, showing a difference in understanding between the two countries. 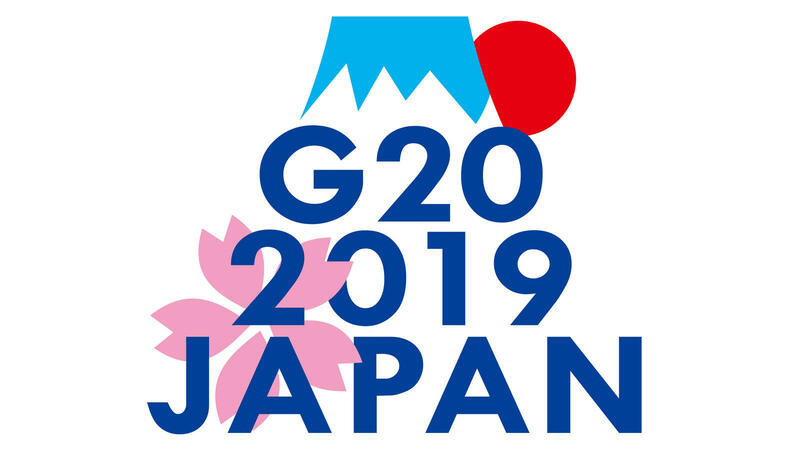 Regarding the importance of multilateral cooperation on the world's issues, which the Trump administration takes a skeptical stance on, both Japanese and South Koreans had similar views with around 80% of both nationals responding that multilateral cooperation is important. Close to 80% of the Japanese and 90% of South Koreans have no acquaintances in the other country. As per visit to the other country, the percentage of Japanese who have traveled to South Korea continue to remain around 20%. On the other hand, the percentage of South Koreans who have traveled to Japan has increased 6 points over the past year and now constitutes over 30% of South Korean responses.At the same time, more South Koreans have traveled to "China," while more Japanese have traveled to "the United States." 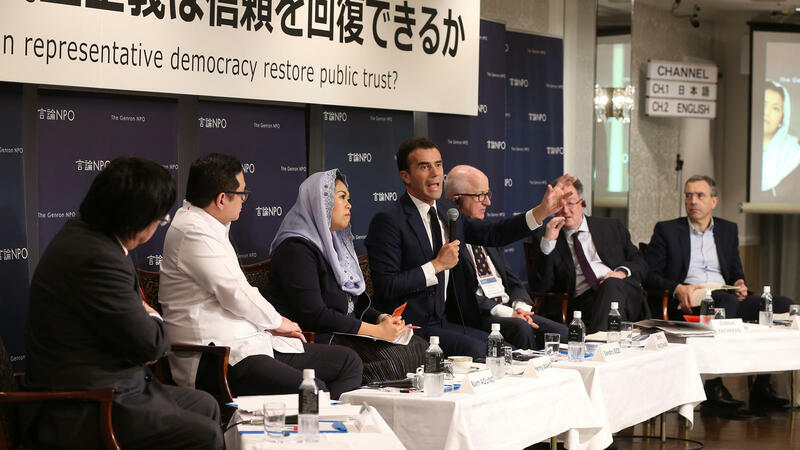 Over 90% of both Japanese and South Koreans acquire information about one another's countries through domestic news media and are especially dependent upon "television" sources. In South Korea, however, about half of the South Koreans also acquire information through "South Korean dramas" etc. and "through "family, friends and acquaintances' experiences."